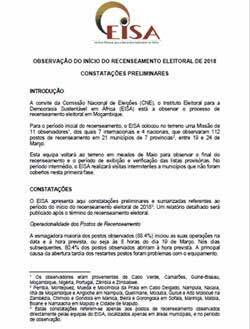 Ahead of Municipal elections scheduled for 10 October 2018, EISA deployed a team of international short-term observers to partially observe the voter registration process (to be conducted from 19 March to 19 May 2018) in selected municipalities in Mozambique. 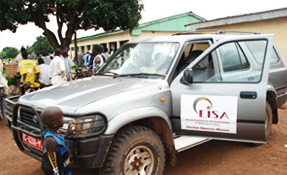 This independent assessment of the voter registration process is the first to be conducted by EISA in Mozambique and the first ever conducted by an international organisation in the country. Observation was conducted from 14-25 March 2018. 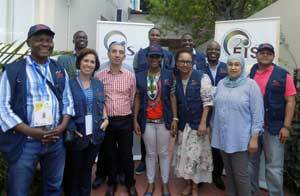 As part of consultations with national stakeholders, the coordination team of the EISA Voter Registration Technical Assessment Mission paid on 19 March 2018 a courtesy visit to the Chairperson of the National Electoral Commission of Mozambique (CNE) and member on the EISA Board of Directors.